State certification is Florida’s premier stamp of approval for minority, women, and service-disabled veteran business enterprises. It is widely accepted across the State of Florida in the private sector as well as cities, counties, school districts, hospitals, and other governmental entities. The goal of the Office of Supplier Diversity is to increase the number of business enterprises in the State of Florida. Certification officers are responsible for identifying and certifying business enterprises by conducting thorough and effective eligibility reviews while ensuring that vendors receive prompt and responsive customer service. Eligibility criteria can be found in Chapter 287, Florida Statutes, Chapter 295.187, Florida Statues and Chapter 60A-9, Florida Administrative Code. The Office of Supplier Diversity maintains a directory of certified business enterprises online. Please feel free to contact us if you are interested in using either eWareness or our Veteran Owned Business Project as a contractor or subcontractor: (800) 517-4130 or locally at: (321) 953-2435.
eWareness, Inc. is a United States CVE-Certified Service Disabled Veteran-Owned Business. We help government agencies meet Veteran Owned and Service Disabled Veteran Owned procurement guidelines. As a certified Service Disabled Veteran Business (SDVOB) specializing in technology and marketing services, we have the staff and the expertise to help you. Add in our Customer Service Policy, and we’re sure you’ll find us to be a company you’ll want to do business with time and time again. 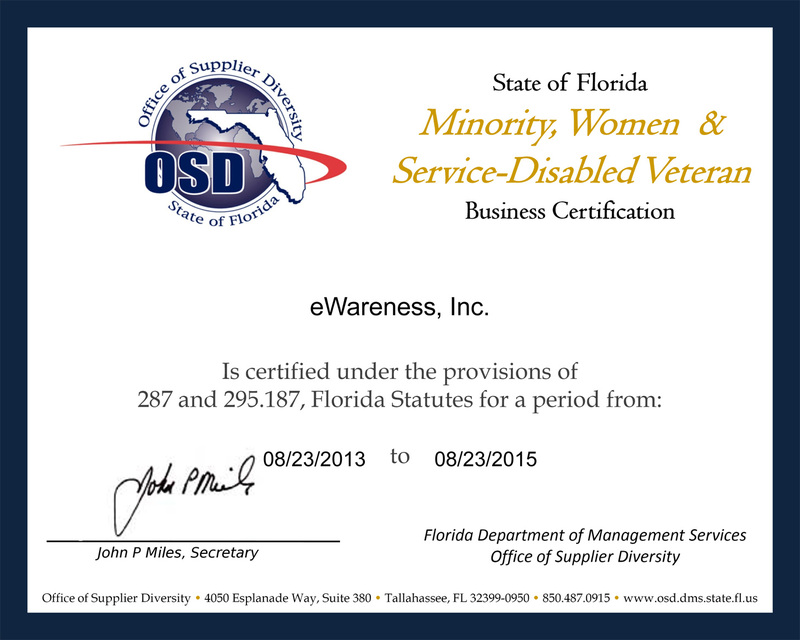 eWareness is also a certified Service Disabled Veteran Owned Business (SDVOSB) by the Center for Veterans Enterprise (CVE). Our certification is valid through July 31st, 2015. Be sure to view our profile on the Veteran Owned Businesses Directory for a list of businesses owned by US veterans.